After I picked up my Canon WFT-E4 I found it very hard to get set up. The manual is a textbook example of how to confuse people, and even with all the advice on blogs and forums, after clicking through the setup wizard on the camera at least 10 times with no success, I was ready to give up. Eventually I ignored all the tips and set up the device using the WFT Utility that you can download onto your computer. This allows you to set the configuration on your laptop using a much easier interface, and upload them to the camera over a USB cable. Everything was up and running very quickly and easily. Go to System Preferences (found under the Apple menu at top left). Chose Sharing. 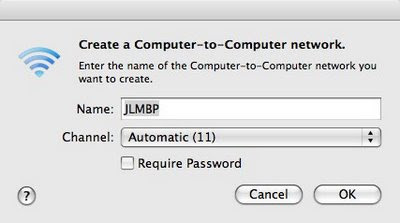 Set the Name as your network name, the Channel to automatic and uncheck the Require Password box. Go to System Preferences (found under the Apple menu at top left). Chose Network. Click on the Advanced button at the bottom right. Give the settings a name in the top text box: e.g. “Adhoc_FTP” and save them. Next, connect the camera to the computer via USB. Upload the settings to the camera by clicking on the Upload Settings to Camera icon at the top of the WFT Utility. Save them on the camera as Set 1, turn the camera off and disconnect the USB cable. Congratulations! You should now be ready to shoot. You should see a flashing green LED on the WFT, and the LCD screen on the WFT will show the signal strenth of the connection to the computer. Transfer speed should be good up to about 20m distance. Once you have the wireless transmitter up and running you can customise how you would like the camera to behave with the options in the Setup section of the WFT menu. - Set the camera to shoot RAW + small JPEG. You can chose to have the WFT transmit every image as you shoot it, or configure it to only send the images you want while you review them on the rear screen when you hit the SET button. This is great if you don’t want your client to see all your setup shots, or if you are shooting fast moving sequences, you can send just the good images. 8. That's it, you're done! I hope this helps anyone who is having trouble getting FTP mode to work on their WFT-E4. Once you get it up and runnning the device is great. Julian- Thank you...thank you..thank you! After a few attempts, I finally have the Transmitter working. My confusion was the Login Name and Password. Originally, I was using the Network's Name and Password, not the Computer's Login Name and Password, which results in an error code 45. Duh! Thank you again. Hi Don, glad you've got it working at last. It's a pain to set up but now it's up and running I love it. 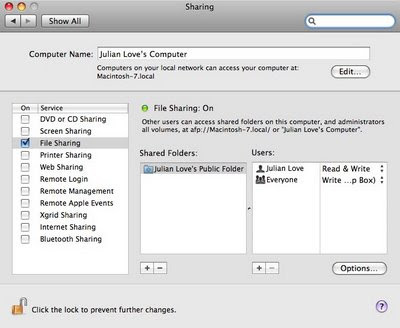 Julian do you find you need to recreate the ad-hoc network on the macbook each time? This is in your step 2. I can't seem to get my macbook to remember the ad-hoc network. If you switch back to using your regular network you will need to setup the ad-hoc network next time you want to use the WFT. Have you tried PTP mode yet. I can get it to work sometimes but it keeps stopping and when I check the menu in the camera the WFT settings menu has dissapeared and I have to switch the camera off and back on to restore the menu on the camera. Hi John - I haven't used PTP mode, for the work I do that's not so useful. I have heard that it loses the connection more easily and uses up the battery much faster than FTP. OTOH you do get full remote control of the camera including live view. 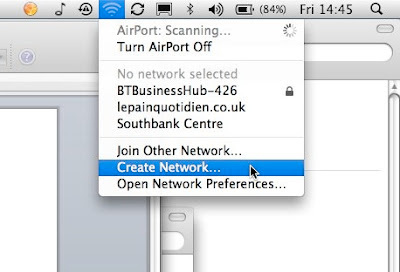 On a Mac, you should be able to save your ad-hoc network by creating a "location" in the network preference panel. Just create the ad-hoc network, and then at the top of the Network control panel you'll find a pop-up selector called "Location". By default, it's "Automatic", but if you click on that, you'll see you can create a new location. Create one, (maybe call it "WFT Ad-hoc" or something memorable), and it will save the network settings. Now you can switch between "Automatic" and your ad-hoc network configuration at will... (just remember to set your location back to Automatic after using your WFT). Thanks Pater - great tip. 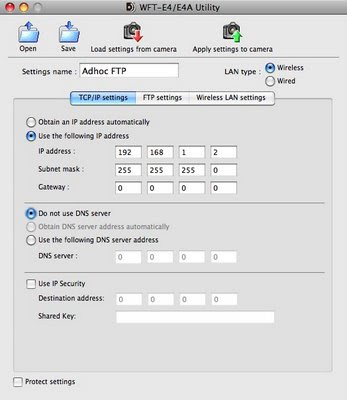 To upload the settings, connect the camera to the computer via USB, then click on the "Apply Settings to Camera" button at the top of the WFT Utility screen. I haven't tried it in PTP mode. Anyone else? yes I'm using the PTP with out any problem (on a MacAir). Can't get the FTP installed. So our problems are reversed !!! I installed the PTP (several times) without any problem (in connection with a 5D II). One tip maybe, get rid of ALL Canon software and re-install them again using the original CD-ROM you got with your camera. When asked for "Easy Install", use THIS option. Hope it helps. Good luck!!!! Thanks Julian for your time. got my FTP up and running. Don't know how and what I exactly did in the end, but it works!! Many thanks since it was mainly due to your info that I succeeded. So thanks a million. Guys, nowhere can I find whether the wft transmitter will also transmit the video files using any of its protocols. Anyone can test it for me? Finnaly got it running. Thanks Julian!!! Took me about a day, but it's working now. Now must see if I can view the pictures instantly in Image Browser. Somehow i can't find that option. with image browser it is faster? or are you using something else? I really appreciate the help you offer and the knowledge you share in this page, I did step by step what you said, and it work fantastic, I'm using now my transmitter on my Macs without problems. Thanks again for you guidance. New mac book pro with os 10.6. My new WFT for the 5D mark II does not work. Any way around it? I've been trying to make it work bug no luck yet. Wifi sharing is working fine from my Mac Mini. WFT Utility seems to be configured correctly because when I do writing test to the target folder, it works fine. When I connect the FTP server from the 5D during pinging to see if there is any active communication set up. Interestingly, the ping responds just one time whenever I try to reconnect and then it fails after that. Great article! Have you tried setting up the wireless connection without using manual IPs? I can't believe the Canon device only works with their default addresses. Yes it does work with other IPs, but these are the defaults for the transmitter so require the least amount of configuration... If you pick something else then you have to change the IP address of the transmitter too. What a Godsend this site is. I cannot get the camera connected to my mac. The instructions say that I need to run the programa WFTPairing, that usually should be in the folder of EOS Utility, but I do not have the program. How can I get it? EOS Utility does not need to be running for the images to transfer. The FTP client on the Mac that you set up at the start does the transferring for you. The images will appear in whatever folder you specified in WFT Utility. You can then point your favourite app (Lightroom, Photo Mechanic etc) to import from that folder. 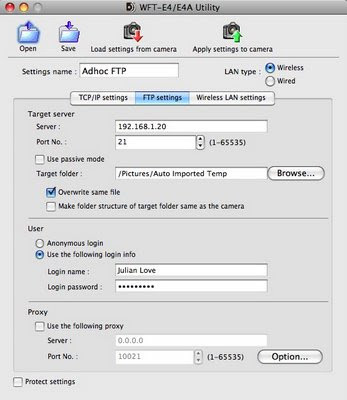 If nothing is happening then check you are actually sending the images from the camera - you will get an error message in the WFT menu on the camera is it cannot transmit. I seem to have the same problem as mentioned above. I cannot upload the thing to my camera (EOS 50D) despite having everything up to date and precisely as in your instruction (which is very helpfull). It says that my camera is not compatible with this function. Any thoughts? Thijs - I can only advise on the 5d mark II and the WFT-e4. I'm afraid I don't know how the 50D is different as I've never used that camera. Thanks so much for this article. The nearly 100 page manual from Canon is pretty much useless. You managed to distill it down to only what you need to know. I almost through the transmitter away until I found your post. 1. Shooting on location. You're shooting outdoors, perhaps in a remote location, or at a commercial facility where you do not have direct access to the company's internet. Does this protocol allow your MacBook Pro to receive images wirelessly from the WFT? How close must the laptop be to the camera to pick up a signal from the camera? 2. Shooting in the studio. Is this the protocol you would use to connect to your own wireless network? 3. Do you have any updated info on transfer rates with the new WFT and the 5DMii? 1) You do not need to have a separate wifi network to transmit images. The WFT can connect wirelessly to a laptop with no other equipment needed - it will work in the middle of nowhere. The range varies a bit depending on conditions but is approximately 20-40m. 2) If you are in the studio you can use your own router to extend the range, or you can use it in PHP mode which will give you full remote control of the camera from the laptop, including live view. I have not used it this way however so I don't know the details. 3) I don't know if the new WFT is faster. I have the old version and it is plenty hast enough for JPEGs but is slow with RAWs. Absolutely fantastic. Thanks Julian. Never even looked at the manual. I have the same problem as geil had, your whole beautiful tutorial falls apart when I connect via USB and try to uploas the settings, al I can get is the same error message "Connected camera is not compatible with this function." again and again. anyone have any ideas. If not, anyone wanna buy my WTF-E4? I only have a few more hours of my life to burn trying to make this thing work. I cant thank you enough, my setup was working but the adhoc is way more convenient. Worked on my first attempt, why couldn't Canon do this. Now I can shoot 31 MB Raw files and I'll see the image within 15 sec in Lightroom 2.6. Hi everyone - apologies for the delay in moderating the recent comments - I've been away on a 7-week shoot and the Brazilian version of Blogger wouldn't let me log in! Anon...I got the same error when i ran WFT independently of Canon Utility. Connect using wft via utility then the settings will upload correctly. Julian, thanks a lot, I had given up the WFT for jobs where you are constantly in a hurry and can't wait for the RAW file to get to the camera only after 15 sec or so using the EOS utility. I just had a shot in a public place with people all around and a very precise job to do. No cables, great ! I agree this modus operanti should be sent to Canon, I lost so much time on it before. Concerning some problems I read coming up several times : In step 4 enter the login before chosing the target folder, if not target folder stays grey. Thanks Bastiaan - that's a useful tip - I'll update the post to include your info. Julian. Hey Julian. Great work my friend!! The unit says it has 100m range...you said you could achieve more range by using a router. How would the router be configured please? Hi John - I don't know, I've never used it this way.... anyone else? Me again...can't find one of these (WFT-E4II) anywhere :( But maybe the version 1 (WFT-E4) is just as good. Any ideas?? Hi Julian, I'm a windows user and there is nothing on the net for scruffy cousins like me so I used your guide as a start point and after a few days of faffing I got it sorted so huge thank you!! My only issue is that i could really do with adding a router for extended range so if anyone has any tips that would be awesome! We've tried several times, but when we attempt to upload the settings to the camera, all we get is ""Connected camera is not compatible with this function." ...all other settings are exactly as in the tutorial.. any ideas? 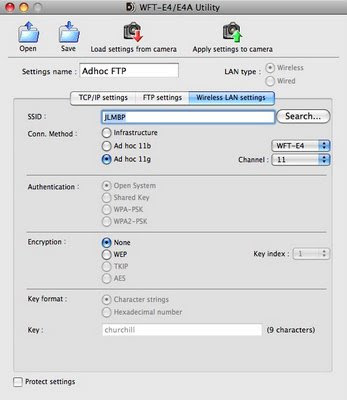 "Also people who get the error "connected camera not compatible etc" while trying to upload should try with the WFT attached to the camera.Then in the menu WFT settings choose 'disabled' and then upload. I could not upload untill I connected the WFT to the camera"
Awesome it works but i need a extended range not sure if AirPort Express can work? On a side note... Regarding the WFT-E4... Can we transfer RAW files from camera to a HDD using the USB connection? That would allow us to backup into a HDD after a full day of shoot. Hi Julian. Thanks a lot for your tips! I also used the same adhoc to connect trough eos utility, and worked all right! Thanks again. Billy, did you manage to get an extended range using an AP? Not sure if this has been brought up yet? Before I get to the point, I am quite new to DSLR stuff, not been doing photography seriously for a good few years, and just sold a few of my Nikon bits n bobs including the FM2 body.. and alas, It bit me... AGAIN..
so this time searching for DSLR with video.. yadda yadda.. anyway, been researching for a bit, found your blog and saw that a few users were having trouble with the wifi thingy bobs. I did a little more research since my last post here... and have realised that some may be interested to know that if they wanted to, that they could control their cameras from a wireless link far more than the 100M stated in the manual - by a few additional bits of PC hardware, I am just wondering if anyone was interested in learning a bit more about this? When I take a shot, it will create the folder I configured in the camera within the FTP folder on Win 7, but it doesn't write the image. I have wide open access for read and write also and still not working...any ideas? Just to throw another candle on the cake, Thank you so much Julian. I am a photographers assistant who took on the daunting task of WFT with little to no network experience, after struggling for a few weeks on and off, i came across this post. agreed, it should be the first google hit. as a word of advice, tripple check word for word this tutorial. Should anyone want to set up via a PC I now have a very comprehensive guide from Canon. Much easier that their manual. I'm looking for an application for my macbook pro that will display a real-time slideshow of my ftp folder. This would be for live events to give a preview of the shoots taken. I've not found exactly what I want and wondered what you are using or know of. John - I set up an auto-import folder in Lightroom. If you leave the software in Loupe view it will automatically fill the screen with the most recent shot taken. thanks so much for this tutorial. I worked perfectly for me after i downloaded all of the software updates from canon. if i could ask, would you mind elaborating a bit on how you set up the auto-import folder into lightroom from the EOS utility? Thank you sooo much for the step by step set up of the Canon WFT E4A. You really cracked the puzzle in a very simplified way ! I don't think Home Edition will work, it doesn't have the networking capability. 1) Create a folder called "Auto Import Temp" and set this as the folder which the WFT will transfer pictures to. 3) Set the Watched Folder to be "Auto Import Temp" and set the Destination Folder to be "Auto Import Photos"
5) To turn on Auto Import, go to File/ Auto Import/Enable Auto Import. It will show a check mark next to it when it is enabled. 6) Put Lightroom into the Library module in Loupe View (keyboard shortcut E). Every time you shoot, the WFT will put the image in the Auto Import Temp folder. Lightroom will check this folder every second, and when it sees a photo it will copy it to Auto Import Photos, render a preview and show it full screen in Loupe View. By default it will always show the most recent image. You can scroll back and forwards with the arrow keys. Or you can hit G to bring up Grid View to see all the recently imported photos. I have the WFT-E5B and a Macbook Pro. I have followed this to the letter and I get the green light but it will not transfer the images. It will not even open the FTP page. Any ideas, this is a lot of money for a bit of kit that I cannot get working. OK, I have got the files transferring ay last YIPEE. Now all I need is to be able to view them. When I put in my browser http://192.168.1.20 it says failed to open the page. I have tried looking at them in lightroom but that does not seem to work. Its the FTP I cant get though. Is there a way to bring them into Aperture. Trouble is this is my first MAC but we are getting there. OK got it all working except for the FTP viewing. Got it working in lightroom as well> Any ideas on the FTP ?? Kevin - the pictures will be transferred into whatever folder you specified in the FTP Settings screen in the WFT Utility. To import them automatically into Lightroom follow the steps in my comment above. I don't use Aperture so can't advise on that, but pretty sure it will do something similar. Got it Julian. Thanks for your quick answers. Great help and much appreciate. It would have been an absolute nightmare without this page. I find this thing slow to upload and I am sending small JPG's so in reality I would have to match the RAW files later. I am thinking of returning it and putting the money towards a lens. I notice that there is an Ethernet point on the WFT-E5, can this be used for tethered shooting or is it just for file transfer. I was wondering if it would befaster than the USB. Suppose i should read the book but this thing is doing my brain in. Julian, like a lot of other photogs, I'm really glad I came across your post on this bloody WFT-E4 from Canon. My main reason I got it was I ruined my USB tethering connection while tripping on it on a shoot. Canon wanted $600 to repair. I said, Its time to try this wireless transmitter. I got all the way to your step 5. where you say to upload settings to camera. Since I ruined the USB connection, I'm unable to do it that way. Then I thought I could copy to Flash card and upload that way, but I'm having trouble. Do you have a work around for this problem? you should be able to manually input all the settings directly into the WFT. That's what I did to get it to send to my iPad. Hi Julian this may b a stupid question but I would like to ask do I need a router? Or the set up requires just your MacBook and your camera then your all good? As long as the MacBook near you 20m? Thanks! Johua - yes all you need is a laptop, the camera and the transmitter - no router required. Hi Gillian - the transmitter model you need depends on what camera you are using. The WFT-E4 is for the 5D mark 2, the 1Ds III and 7D each take a different one. Check the Canon site for details. If you're shooting up to about 20m away from the laptop you don't need a router, the ad hoc network from the laptop will be enough. If you are further than that then a router can extend the range - I can't advise on what model would be best though as I don't use it this way. Wow! Great tutorial for setting up the WFT with ease! It worked like a charm with my WFT-E5A (7D) and Mac! Tried it with my Windows 7 tablet and it worked... though setting up an FTP on Windows is a nightmare! But thank you so much for taking the time to show us. Had this page opened for a long time and when finally decided to set it up, I found that there is no FTP option in Lion anymore. Any advice how to work around it? after that just follow the steps. Thanks Max - I've got a MacBook Air with Lion arriving next week so that's very helpful. You must wear a long white robe Julian because we are all falling at your feet, me included however, my problem is different; I'm on a Windows computer running XP. I'm shooting a 5D2 with WFT-E4A with an end goal of using my PAD for live view for landscape photography. Can anyone provide a play by play like you've provided for MAC users? Thanks for all your time and assistance. unfortunately I could not do, my system is the Lion and the error Connected camera is not compatible with this function. you have any explanation for that? nothing appears after I enabled this, you have done something wrong? Thankyou so sosososooso much julian ... i have managed to set it up, but now struggling with the images opening immediately in any of the software i have... i dont; want to invest in lightroom or CS4 for laptop... has anyone used any of the canon image browsers etc successfully or found cheaper application? Your post is so good. However, I still have the "Connected Camera" problem. Attach the WFT to the camera, turn it on and navigate to the WFT Settings menu. Under Connection select Disabled"
Do you mind tell me how to set "Connection select Disabled"? Sorry for this new bird question. Hope you could help! transmitter and how to set it up with a 17inch mac book pro computer. BUT PLEASE IT SHOULD BE A GUIDE FOR A STEP BY STEP PROCESS. THANK YOU VERY MUCH, YOURS MUCH APRECIATED, BARRY GEORGE. Hi Louise - I just use Lightroom for browsing the images so not sure what else you can use. Anything that can monitor a folder and display the new images should work. Hi my name is Wahono. 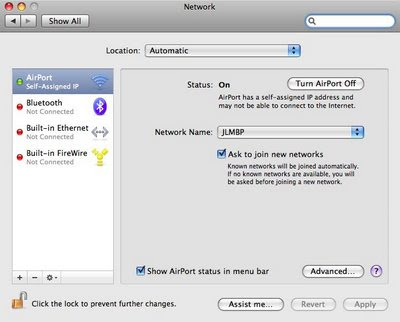 1. in my system preferences -> network -> airport -> advanced -> TCP/IP. 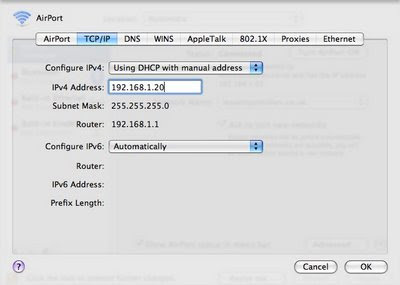 I have typed the IPv4 address and I've changed the configuration to using DHCP with manual address, but the router number was not came up. Can anyone tell me about this problem? I can not browse my target folder in FTP settings. It said, "Could not connect to the destination server. Could not resolve the server name." Does anyone can help me to figure out this problem? Julian - Do you have updated instructions since you got your Macbook with Lion? I have successfully set up the WFT E4 II with my iPad but am running into the "no FTP server" problem noted above. I did get some software to "turn on" FTP services but the choice to use it in Step 1 of the instructions does not show up. Can I just use this post to thank you for your straightforward tutorial. Thanks to this page I now have the WFT-E4 II to my iPad, and macbook. 1. tethered shooting to my macbook with lightroom auto import, using my studio router. 2. tethered shooting to my iPad, using shutter snitch, again using my studio router. 4. wireless tether for location work using my iPhone 4s as a personal hotspot, connecting the wft-e4 and my iPad to my iPhone, bypassing the need for a separate pocket router. They work extremely well, i haven't had a single problem with my studio set up or my iPhone set up. Small jpegs transfer over in around 2 seconds. my clients absolutely love the set up. I do a lot of newborn and baby shoots and this is fantastic for that. I will also be watching this page so If anyone would also like any help getting any of my set up replicated, fee free to leave a message and i will reply as well. Thanks so much Darren for offering some help. I am eager to set up the WFT-E4 using a portable Cradlepoint Router and would love to know how you succeeded in doing all 4 in your email. When you say "tethered shooting to your macbook with lightroom autoimport, using my studio router" are you hard-wired between camera and macbook or it is wireless through the router? Any help you can provide as I try to do this in next few days would be GREATLY appreciated. My wft-e4 connected wirelessly to my router, and my macbook also connected to my router wirelessly. I have specified a folder where all my studio shots are saved (small jpeg) and i have lightroom "watch" this folder for any changes. As soon as a file is sent to the folder, lightroom imports that file and is shown on the screen very quickly. Thank you for your help, it's working now on my mac. 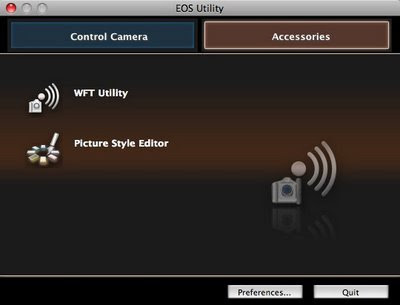 For EOS you will have to do the same and use the wftpairing utility to connect to the camera. I think I follow most of what you are saying. But, I had read in Canon materials that you could NOT do PTP (also called EOS Utility Mode) protocol in so-called Infrastructure mode with a router. Canon indicated that a Mac can only do PTP communications protocol in Ad Hoc Mode. (2) PTP (Picture Transfer Protocol; sometimes called Peer to Peer) which is also called EOS Utility Mode. Good for remote chooting, where you can control camera remotely with EOS utility. You can upload photos, but it is slow and locks up occasionally. Canon suggests this can only be done on AD HOC network, but you suggest otherwise (i.e. I can use a router). (3) WFT (Wireless File Transfer mode) which Canon used to refer to as HTTP. Camera runs its own built in web server which allows a browser on a laptop or iPad or iPhone to access the images (and some features) on the camera. This mode should permit LiveView from iPad or MacBook. But, you cant do remote video. Thanks. I will keep trying. Please correct anything above that is incorrect. Has anyone used the WFT-E4-2A w/ a MacBookPro running 10.6 or higher to control the 5D Mark2 shooting remotely. I bought this for that purpose and am wondering if it actually works. Tried many setups but the connection dies and will not activate controls. Airport signal is good - testing from 1 foot. If my camera USB connection point are spoiled， what we can do to Upload settings to camera? I've used your much welcomed guide to set up the WFT-E4 on a Mac in the past but struggled horribly getting it working correctly with Windows 7. Cheers Gareth - quite a few people here looking for help on Windows so thanks for helping them out! is it possible for the WFT to wirelessly send the images to 2 laptops after each shot is taken? hi, after a few days ripping out my hair and swearing a lot finally got it to work. Using 10.8 i dint have the ftp thing so tried using os x server. Biggest issue was i couldnt get the camera to see the laptop. After speaking to canon for a few mins they suggested connecting not as ftp but as eos connection, all automatic just use the network i created on mac laptop and hey presto the camera paired and an image appeared on canon remote shooting. As i use capture one this wasnt much good but at least i was connected. In eos utiity preferences you can register capture one and select the capture folder as the destination. Shoot the camera and a preview pops up in utility and then capture on ( has to be open ) the window opens showing the image. In utility you can decide to send jpeg only as raw takes forever. On the wft in eos coneection this is greyed out. No need for ip addresses and servers so as long as it works then i'm happy ! so i have been working on this with google of course. Canon EOS Utility - Not compatible, Canon do not seem to have an update. Canon WFT Utility - As above. 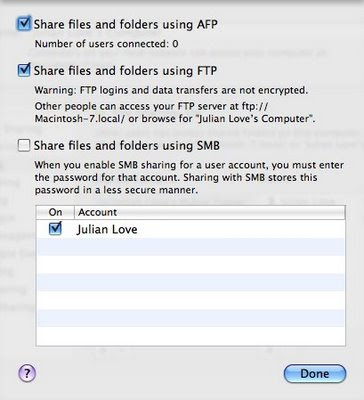 Mac, File sharing preferences - FTP option not available. The previous post is helpful in resolving the FTP issue in Terminal but I've still had problems getting up and running. Any chance of an updated set of instructions considering all the changes and solutions people have posted, or better still a video walk through would be both interesting & greatly appreciated. Disappointed with Canon & equally Apples lack of attention to these things. I take back my previous post! Located Update file on the Canon website for Utilities and found some very helpful setup guides. Hope this is helpful for anyone experiencing difficulties setting up. How do I do this on a Pc? Hello I found this blog after a long googoling and I hope I can find here some useful info. My problem is this: I have Canon WFT-E5B and I'd like to to transfer photo, taken with Canon EOS 7D, to iPad app named ShutterSnitch via an ad hoc created wifi. I'm experiencing a lot of trouble to properly configure WFT-E5B for the purpose. Does somebody here can help me with perhaps a step by step procedure ?